When I regained consciousness we were deep underground. They had me trussed up and tied to a pole, and were carrying me like a massive cocoon. I was completely naked. The friction from the ropes was burning my skin. My arms and legs were pinned but I could move my head. The walls on either side were lit with torches that flickered as we descended. There was a caravan of locals in front and back, and I imagined they were escorting me to the temple. None of my team-mates were being carried with me. I was the last. We were sitting in the lounge of a corporate employer that did not admit we existed. This was normal for people like us. We would be inspected by the corporation's agents, have our backgrounds investigated and our motivations questioned. Once we had finished this cute little white-collar gauntlet, they'd give us the information needed to do whatever it was they wanted. If we failed, we'd be left to fend for ourselves. The meeting could just as well have been held in a back room somewhere, but instead we were brought in - after hours, mind - and sat in a large room with a nice view and far too many vidscreens on the walls. In the middle of the room was a large wire sculpture that looked like a spaceship's migraine. I imagined they'd brought us here to impress us, maybe get a little solidarity feel going. Funny people, these. To their credit, they didn't waste any time. They got in a team that vetted us, asking questions that would have gotten them a bullet to the face under any other circumstances. They finished up, left the room, and a single agent entered in their stead. He was a tall, thin man in clothing that fit him well, and as soon as he was in the room he dimmed the lights and laid out images on the vidscreens. Our employer, he said, was a Minmatar corporation that had interests in low-sec space. Now that the war was on, certain restrictions had been relaxed, and the right people stood to make quite a lot of money. He pointed to one image. It showed a greenish-brown planet with the Amarr logo superimposed on its surface. "We've been doing surveys on that one. Turns out certain areas have a high concentration of a valuable ore required for high-tech manufacturing. One valley in particular is so rich that its excavation alone could put a company into space." "I've been to space," Chalmers said. "How was it?" I said. I grinned. The agent cleared his throat and continued, "So we'd very much like to gain control of that area. There's just one problem." He nodded. "A society of Amarrians. Absolutely backward people, even by their own standards. Nobody's even looked at this planet for eons, let alone helped them out of the stone age. We don't have much information on them, but overhead imagery-", he waved a hand and the planetary image zoomed in, becoming a bird's-eye view of a land mass, "shows they've settled in that exact spot. You see these stone buildings here, here and here; that's all they have. Most of them serve some religious function, although the imagery lacks the detail for us to determine anything more." "Does it matter?" I asked. "We're hardly going in with smiles and Scriptures." "You cannot kill them," the agent said in a serious tone. "My employer is adamant that there be no unnecessary deaths, lest the media and public opinion in New Eden turn against us when we ramp up production. A lot of light will be cast on our operations there and it will not do for any local to say he lost his family due to our greed. So yes, it does matter." "If we can't kill them," Chalmers said, "how the hell are we going to get them off the land? Throw the Scriptures over their heads and hope they run and fetch?" "Almost," the agent said, and his face twitched into a leathery smile. "You're going to blow up their churches." Logic was, we'd install explosives at key locations and make the locals - who we must've assumed were pretty stupid; more fools, us - think than an earthquake, or God's own hand, wanted them to pull up stakes and leave. Nobody was to be harmed; it would be fallen churches in the night, and the locals waking up to the ruins of their faith. Then, once the corp could set down roots, get something going there and worm their way into the local economy, such as it was, they could deal with the populations on the other, less metal-rich continents. Smiles and Scriptures, smiles and Scriptures, and a few coins for the commoners in exchange for some patches of land. The first dose of unpleasantness came on our way to the dropship. We were to be shunted in pretty far away from ground zero and would have to travel several days to reach the area. The agent contacted us with an update on the soil we'd be traversing. "It's poisonous," he said, and quickly followed it up with, "Not fatally, not unless you intend to eat the earth. But the minerals we're after aren't the kind of things you want in your bloodstream. It may be that the inhabitants will be a little ... odd. Not that it's a problem for you guys," that leathery smile again, "and if anything it'll be to your benefit. Tired, worn, exhausted people won't be listening to bumps in the night. Get in, plant the packages, get out again and you'll be fine." The second surprise came after we'd landed and done a whole day's trek towards the site. We'd been told there was no other tribe living in the area, which appeared to be true. But we'd also been told that there were no settlements outside the valley where they lived - even though the land everywhere else was just as rich in bounty and raw materials - but we saw small ruins on the way, signs of past inhabitation. Some of those ruins had a decidedly religious slant, what little there was left of them. We spent the night in one, glad to have a roof over our heads, but the imagery they'd carved into the rock gave me a headache, and I was glad to be out of that damned place by morning. The last surprise before everything went wrong was a quick communication from the agent. We'd been told there would be total communications blackout once we landed - not that we needed to worry about the locals, but there might be things in space listening out for our passage - and so the message was short, terse and not all that comforting. "New data. Bad place. Tribe long-term poisoned from minerals. Every fourth child dies in its crib. Iconic analysis shows Sani Sabik influence. Get in and get out." And we, in all our civilized glory, reacted to our taut nerves with the dumbest emotion possible: Bravado. We started acting as if we belonged. We were still a day's journey away from the valley and our high-tech, all this wonderful high-tech, showed no movement nor heat signatures moving about, so we barged through the bushes and stalked down the paths. It didn't occur to us they might have smelled us coming, and prepared for our arrival. When the trap closed, all I saw was air. We were hoisted to a great height in a split second, and as we screamed and grabbed for our weapons we were dropped to the ground. I landed so hard on my shoulder that I felt its bone grind into my neck, and from somewhere close I heard a sickening crunch. We all lay there in one pile, writhing about and disoriented, surrounded by the woven threads of the net that had caught us. I didn't feel broken, so I called out to the others, but before they could respond I realized the crunching sound had come from a number of broken containers around us - they looked like thin bags of dried tree-bark - and that the air was now rife with the smell of iron. Everything went fuzzy, and then everything went black. I came to in a sermon. There was no other way to describe it. We were in a large hall filled with people, most of them sitting crosslegged on the floor. The crowd was bisected in the middle, leaving one direct path from the far end of the room directly to where we sat. In the distance I could see a door that I suspected led to the exit, though it was located in the corner of the wall and not the center as is usually the case. We were at the other end and there was another opening in the corner of the wall close to us, though it was only covered by a velvet curtain. I noticed that even though the hall was so packed that people's legs were touching, the area around this door was empty. It was a bad door, apparently. I felt a little giddy and I knew I was going to die. Almost everyone in the room faced us. We sat, too, crosslegged, but our legs were tied together at the ankles and our arms were tied to stakes set in the floor behind our backs. I could turn around enough to see the top of the stake - it was wooden, not sharp, but looked splintery. Also, we had been stripped down to our underwear. Chalmers looked at me from the far end of the row and I recognized his unspoken sentiment from his expression. This was wrong, this was very wrong, and if we didn't take in every little insignificant detail, focus on it and let it expand till it filled our heads, we would panic and we would die. Beside us stood an Amarrian priest of an Amarrian religion that had nothing to do with the Amarr. I recognized some of the symbols on his robe from the ones I'd seen at the ruins a few days earlier. He held a cup and a ladle. Beside him was a large golden vat decorated with precious stones. One by one, the people in the hall - whose clothes were dirty and tattered, and whose bodies were dirty and tattered - came to him, in the slouching sort of amble that conveys a feared respect. They bent forward so that their faces looked at the ground, and raised their beckoning hands over their heads in supplication. We were close enough that I got a good look at their skin, and I saw that it was lined with blackened veins, far darker than any man's should be. Their hands were a spider's web of darkness. The poison at work. The priest's hands, I noticed, were unmarked and looked perfectly healthy. He ladled something out of the vat and into the cup, which I now recognized as a chalice, and handed it to the acolyte, who drank from it deeply. It was not wine. I wished to the gods it had been wine, but it was not wine. The tribe marched on, each member lurching to the altar to take sacrament. 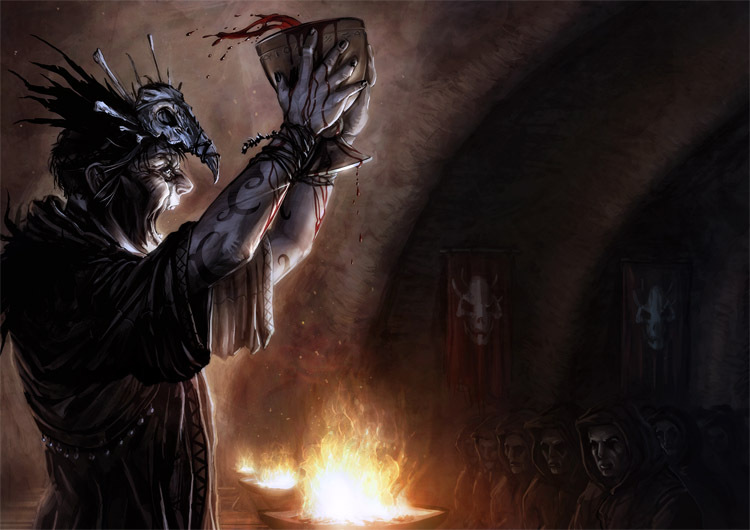 Their blackened hands reached for the chalice. Some brought their infants and held them up with steady hands as the priest gently poured into their mouths. And then it was our turn. The priest filled the chalice and walked over to us. The room was still half full and I could feel every man's gaze burning holes into my chest. He came to me first and held the chalice to me. I turned my head, in refusal but also so I didn't have to look at what was in it. A metallic smell crawled into my nostrils. He stood there for a few endless breaths, then finally moved on to another team-member. We all refused, shaking our heads. Chalmers was last. When the priest offered him the cup he merely shook his head, eyes closed. I could see a vein throbbing on his forehead. I thought everything was going to work out, but the moment the priest turned his back Chalmers made a croaking sound, inhaled sharply, and spat on him. I expected an uproar, that the crowd would rise to their feet and storm us, but nobody moved. The priest merely turned back and gave Chalmers a gentle smile. This infuriated him even further and he started thrashing about, trying to rip up the stake he was tied to. I hissed at him to chill out but he ignored me, tossing his weight back and forth and straining uselessly at the bonds. There was no panic. Several healthy-looking men came in from the wings - their hands completely free of black spiderwebs - and picked up Chalmers, hefting his struggling form as easily as that of a petulant child. They carried him cursing and yelling to the near exit, beyond the velvet curtain. That was nearly the last we saw of him. We heard his screams for a few minutes more, growing hoarse and pained, but saw nothing, until. Until. Until there was a roaring metallic sound, as of a machine coming alive, and for the briefest of moments there was a bright flash, so bright it shone through the curtain and showed us the silhouette of Chalmers, hanging spreadeagled and hooked up to countless tubes that writhed their way around his body as they drained him of his life. The light stayed off but the sound went on until he died. They left us there after the ceremony and eventually I passed out. When I came to I was in some other building with no light and no people and no team-mates around. I drifted in and out of consciousness. Once I awoke screaming someone's name. Every now and then the priest would come in and speak to me, though whether it was really him or some mad delusion, I didn't know. I cried, sometimes. And finally I awoke being carried by the people, into the ground, trussed up like an animal for the slaughter. We intended to destroy their saviors - we, their enemies - but they are a forgiving people, simple but kind. They found a way to live. Old rituals held anew. These blood colonies of a dark and grinning god. My companions had been given a choice. I was the last. They were bringing me now to the holiest of temples, far underground in this place. I turned my head and looked at my hands and legs. My body was tired and weak, and in the flickering light of the torches I imagined I could already see my veins turning black. We arrived, and it was a vast and dark place, a cave big enough for a battleship. We stood on a tall cliff where below I glimpsed a valley, surrounded by other craggy outcrops in the rocks. There were hundreds of light sources down there. At first I thought they might be torches, then realized they were bonfires. I could not imagine how many people were here. In the distance was a building so tall it reached up to the cloudy roof of the cave. It was the shape of a capsule, bronzed and red, covered in gross metallic cables that looked like the veins and matted hair on a newborn's head. Their holiest of temples. The mission was lost and so were we. There would be no rescue from this place. My companions had accepted that, in each their own way, and made their choices accordingly. Now it would be my turn. They are taking me to the temple, to the great altar, where I will choose between the slow death of poisoning or a long life among these people. I will be a martyr or I will be an acolyte. And I know already, with the knowledge of the dreaming, that at this vermillion altar the high priest will greet me, and he will give me the chalice filled with the drink of life; the purified cure of this land; the blood of Chalmers.